The Life of Perry Ray Sanders Sr. He was a devoted father and family man who spent the last 6 months of his life in Colorado Springs surrounded by his grandchildren, Perry Ray Sanders, III, John Michael Sanders, Noah Paul Sanders, and Sunny Lee Sanders, by his daughter-in-law, Lorn Lee Sanders and by his only child, Perry Ray Sanders, Jr. He is also survived by his brothers, Guy Sanders and Dr. Gerald Sanders and his wife Kae Sanders. He was preceded in death by Gloria McMorris Sanders, the grandmother of his grandchildren and mother of his son, his mother, Mary Sanders and father Guy Sanders, his sister, Marynell Sanders and his sister, Marion Sanders. Dr. Perry Sanders, longtime pastor of First Baptist Lafayette, passed away Monday, March 26, 2012, in Colorado Springs, Colorado, at 2 a.m. local time. He was 84 years old. Sanders served First Baptist for 47 years before retiring in 2006. He previously served churches in other Louisiana cities including Baton Rouge and Jennings. Born in South Carolina, he came to Louisiana to attend New Orleans Baptist Theological Seminary. 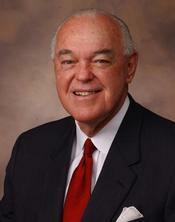 In addition to his service to local churches, he served two terms as president of the Louisiana Baptist Convention, also terms as Pastoral Advisor to the Louisiana Baptist Student Union and Louisiana Baptist Music Conference, both the Foreign and Home Mission Boards of the Southern Baptist Convention, and chaired the Southern Baptist Convention Committee on Committees. A frequent speaker at Baptist Conventions and Evangelistic Conferences nationwide, he brought the closing message to the annual meeting of the Southern Baptist Convention in 1981. Always supportive of civic activities, Sanders was a member of the Kiwanis Club, Fellowship of Christian Athletes, a Division Chairman of the United Givers Fund, Board of Directors of Greater Lafayette Chamber of Commerce, Founding Board of Directors of Acadiana Arts Council, Founding Trustee of Leadership Lafayette, and was inducted into Acadiana's Living Legends. A fan of UL sports, he often brought the invocation at Ragin Cajun basketball games. He enjoyed golf, hunting and fishing. Under Sanders' pastorate, First Baptist implemented an aggressive outreach program and grew from 1,209 members to almost 5,000. The church expanded property and buildings to portions of seven city blocks, including the purchase of the former Mt. Carmel School property. In 2004 First Baptist completed construction of a 2,000 seat sanctuary. Under his leadership the congregation began television broadcasts, innovative music programs, and started language ministries including Chinese, Spanish and Deaf. Funeral services will be held on Wednesday, March 28, 2012 at 12:00 pm at First Baptist Church of Lafayette. Visitation will be held at First Baptist Church from 8:00 am until the time of services. Pallbearers will be Perry R. Sanders, III, Noah Paul Sanders, John Michael Sanders, Jerry Sanders, Mike Placek, Oliver Carmichael, Lannie Richardson, Billy Tew and Dennis Smith. Delhomme Funeral Home, 1011 Bertrand Drive, Lafayette, LA, is in charge of funeral arrangements. Please share your memories of Perry.